The widespread adoption of AI across industries is predicted to drive global revenues of $12.5 billion in 2017 and $47 billion in 2020 with a CAGR of 55.1% from 2016 to 2020. The industries that will invest the most in these technologies are banking and retail, followed by healthcare and manufacturing. Economists designate general purpose technologies (GPT) as those important enough to spur protracted economic growth and societal advancements. For example, electricity is a GPT. A recent Harvard Business Review article designates AI as the most important GPT of our era. In October 2016, both Bank of America and MasterCard unveiled their chatbots, Erica and Kai, respectively. The early version of Erica can track customers' credit scores, look at their spending habits, and offer advice on how to pay off bills. Capital One also recently launched their own chatbot, named "Eno,"" which enables customers to chat with the bank using text-based language to pay bills and retrieve account information. Capital One also leveraged the internet-of-things trend, launching an Alexa Skill for Amazon Echo, and plans to be the first to launch a similar service for Microsoft’s Cortana. General purpose technology is a term economists reserve for technologies that spur protracted economic growth and societal advancements, revolutionizing the operations of households and corporations alike. A sample general purpose technology is electricity. Electricity spawned a multitude of products and sectors, including refrigerators, washing machines, trains and, of course, computers. The advent of electricity radically transformed the world. A recent Harvard Business Review article designates artificial intelligence (AI) as the most important general purpose technology of our era. We’re familiar with the power of AI. It manifests in the form of a robot defeating a world-renowned chess player. A car that can parallel park itself. Devices that respond with tomorrow’s weather when we ask. But much of our contact with—and understanding of—AI revolves around products that affect our everyday lives as consumers. At the organizational level, there’s a larger question around how AI will disrupt industries, and specifically, how financial services will harness AI. The following article will define artificial intelligence, the sphere of its related technologies, the size of the overall AI industry, and the applications of artificial intelligence in finance. This piece is not intended to provide a normative judgment on AI development; rather, it will focus on how AI is disrupting finance. Artificial intelligence is an area of computer science focused on creating intelligent machines that function like humans. AI computers are designed to perform human functions including learning, decision making, planning, and speech recognition. Artificial intelligence enables machines to continually improve their performance without humans providing prescriptive instructions for how to do so. This is significant for a couple reasons. First, humans know more than we are capable of telling. That is, humans may be able to recognize a face or execute a smart strategy in a game of chess. However, prior to advanced artificial intelligence technology, humans’ inabilities to articulate our knowledge meant that we couldn’t automate many tasks. Second, AI technology is superhuman in execution, operating more quickly and often with more accuracy than humans. Machine learning is a method of data analysis that automates analytical model building. Using algorithms that iteratively learn from data, machine learning enables computers to find hidden insights without being explicitly programmed where to look. Deep learning is a subset of machine learning. It has facilitated object recognition in images, video labeling, and activity recognition, and is making progress in perception (including audio and speech). For example, Facebook's deep learning application DeepFace has been trained to recognize people in photos. Many draw the comparison between deep learning technology and biology, but experts generally agree that while inspired by the human brain, it's not necessarily modeled after it. Natural language processing is the ability of a computer program to understand human speech in real time. Research and development is shifting towards systems capable of interacting with people through dialog, not just reacting to stylized requests. Internet of things (IoT) is devoted to the idea that a wide array of devices, including appliances, vehicles, and buildings can be interconnected. For example, if your alarm rings at 7:00 a.m., it could automatically notify your coffee maker to start brewing coffee for you. Wearable technologies that act as sensors when worn are also part of this larger trend. Of course, this list is not comprehensive. 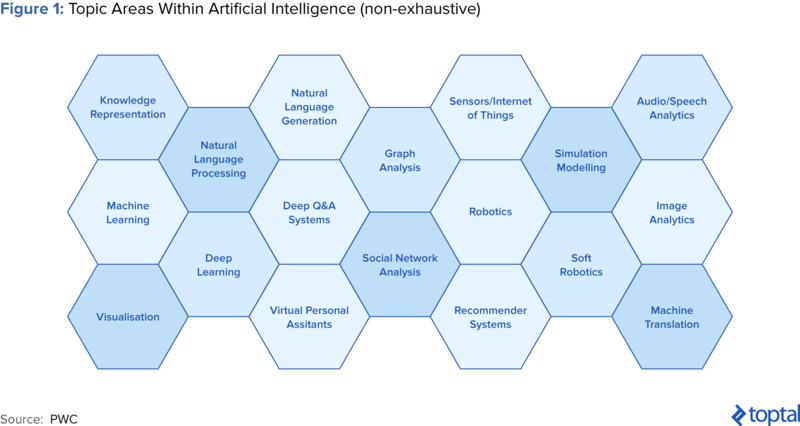 See below for a wider range of artificial intelligence topics and technologies. The widespread adoption of AI across industries is predicted to drive global revenues of $12.5 billion in 2017 and $47 billion in 2020 with a compound annual growth rate (CAGR) of 55.1% from 2016 to 2020. Specifically, the industries that will invest the most in the technology are banking and retail, followed by healthcare and manufacturing. In aggregate, these four industries will comprise over half of global AI revenues in 2016, with the banking and retail sectors each delivering nearly $1.5 billion. 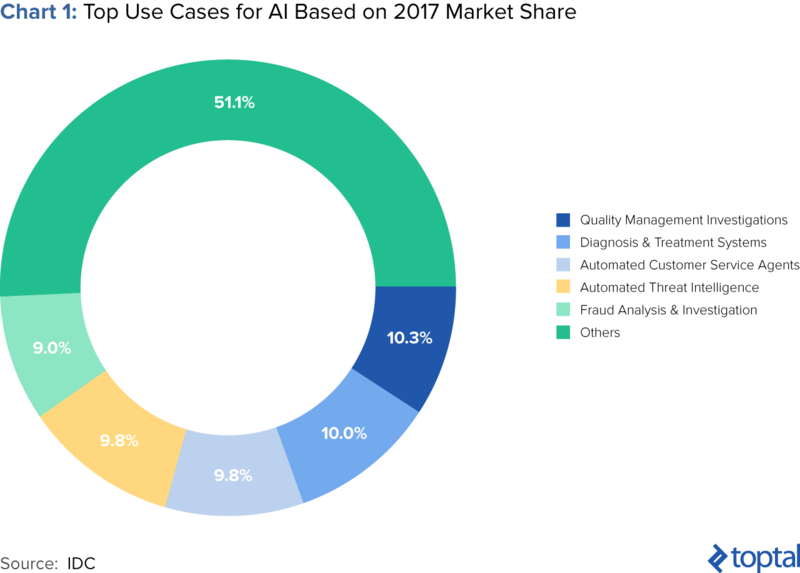 Across industries, the greatest AI investments in 2017 will be in areas such as automated customer service agents, automated threat intelligence, and fraud analysis (see chart below). According to Jessica Goepfert, program director at market research firm IDC, “Near-term opportunities for cognitive systems are in industries such as banking, securities and investments, and manufacturing. In these segments, we find a wealth of unstructured data, a desire to harness insights from this information, and an openness to innovative technologies.” The next section of this article will delve into the various use cases for artificial intelligence in the financial services industry. Artificial intelligence in finance could drive operational efficiencies in areas ranging from risk management and trading to underwriting and claims. While some applications are more relevant to specific sectors within financial services, others can be leveraged across the board. Artificial intelligence has proven extremely valuable when it comes to security and fraud detection. Traditional methods of fraud detection include computers analyzing structured data against a set of rules. For example, a given payments company might set a threshold for wire transfers at $15,000 so that any transaction exceeding that amount would be flagged for further investigation. However, this type of analysis produces many false positives and requires a lot of additional effort. Perhaps even more significantly, cybercrime fraudsters frequently change their tactics. Therefore, the most effective systems must continually become smarter. 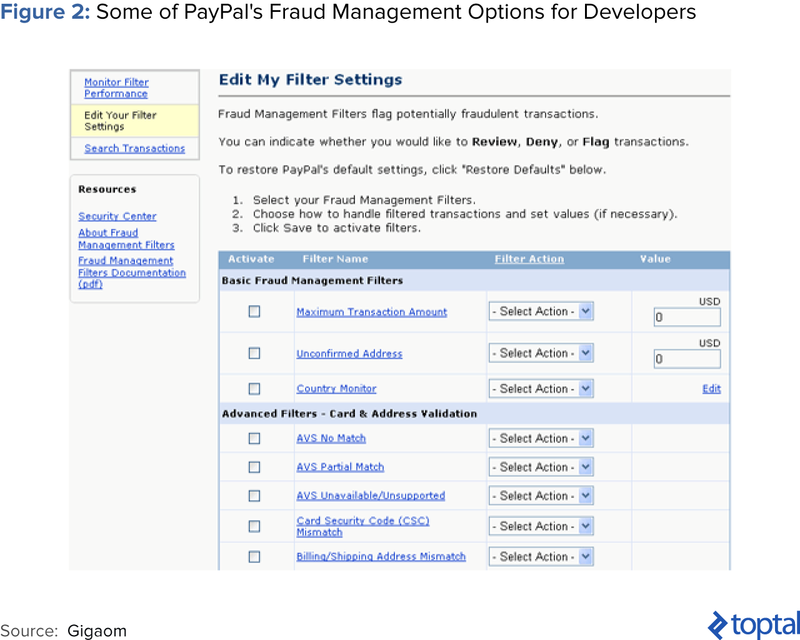 Take payment giant PayPal and its advanced fraud protocols, for example. Due to its scale and visibility, PayPal “has a huge target on its back.” It processed $235 billion in 2015 from four million transactions by its 170 million customers. However, PayPal has been able to boost security by leveraging deep learning technology. In fact, PayPal’s fraud is relatively low at 0.32% of revenue, a figure far better than the 1.32% average that merchants see. For years, investment management companies have relied on computers to make trades. Around 1,360 hedge funds, representing 9% of all funds, rely on large statistical models built by data scientists often holding mathematics PhDs (otherwise known as “quants”). However, these models only utilize historical data, are often static, require human intervention, and don’t perform as well when the market changes. Consequently, funds are increasingly migrating towards true artificial intelligence models that can not only analyze large volumes of data, but also continue to improve themselves. These new technologies utilize complex techniques including deep learning, a form of machine learning called Bayesian networks, and evolutionary computation, which is inspired by genetics. AI trading software can absorb enormous volumes of data to learn about the world and make predictions about the financial market. To understand global trends, they can consume everything from books, tweets, news reports, financial data, earnings numbers, and international monetary policy to Saturday Night Live sketches. To be clear, the above is distinct from high-frequency trading (HFT), which allows traders to execute millions of orders and scan multiple markets in a matter of seconds, responding to opportunities in ways humans simply cannot. The AI-driven platforms discussed above are seeking the best trades in the longer-term, and machines—not humans—are dictating the strategy. Some of these AI trading systems are developed by startups. For example, Hong Kong-based Aidiya is a fully autonomous hedge fund that makes all of its stock trades using artificial intelligence (AI). “If we all die,” says co-founder Ben Goertzel, “it would keep trading.” Traditional institutions are also interested in AI trading technology. In 2014, Goldman Sachs led the Series A funding round of and began installing an AI trading platform called Kensho. For Kensho’s Series B round, in addition to S&P Global, Wall Street’s biggest six banks (Goldman Sachs, JPMorgan Chase, Bank of America Merrill Lynch, Morgan Stanley, Citigroup, and Wells Fargo) also participated. 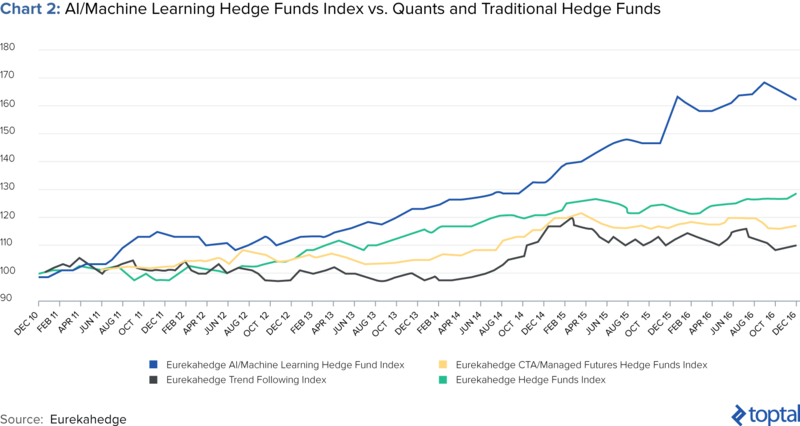 A recent study performed by investment research firm Eurekahedge tracked the performance of 23 hedge funds utilizing AI from 2010-2016, finding that they outperformed those managed by more traditional quants and generalized hedge funds. It will be interesting to observe how AI will impact the trading labor market. Its effects are already apparent at some major banking institutions. In 2000, Goldman Sach’s U.S. cash equities trading desk in its New York headquarters employed 600 traders buying and selling stock. Today, it has two equity traders, with machines doing the rest. Daniel Nadler, CEO of Kensho, declares, “In 10 years, Goldman Sachs will be significantly smaller by headcount than it is today.” And as for the quants, they may find that their skills are in less demand from investment management companies. Robo-advisors are digital platforms that provide automated, algorithm-driven financial planning services with minimal human supervision. While human financial managers have been utilizing automated portfolio allocation since the early 2000s, investors had to employ advisors to benefit from the technology. Today, robo-advisors allow customers direct access to the service. Unlike their human counterparts, robo-advisors monitor the markets non-stop and are available 24/7. Robo-advisors can also offer investors up to 70% in cost savings and typically require lower or no minimums to participate. Today, robo-advisors can help with the more repetitive tasks such as account opening and asset transferring. The process typically involves clients answering simple questionnaires about risk appetite or liquidity factors, which robo-advisors then translate into investment logic. The majority of current robo-advisors aim to allocate their clients to managed ETF portfolios based on their preferences. It is expected that capabilities in the future will evolve into more advanced offerings such as automatic asset shifts and expanded coverage across alternative asset classes like real estate. 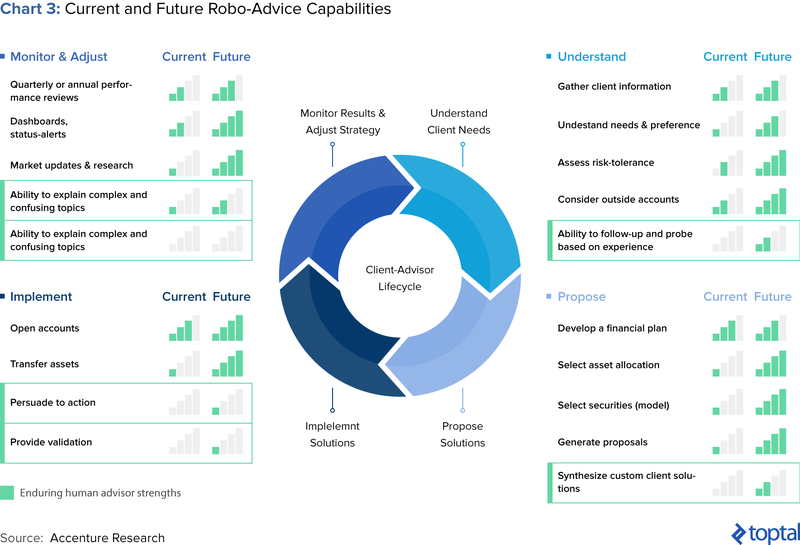 Robo-advisory can have a major impact on the personal finance and wealth management sectors. While current robo-advisor total assets under management (AUM) only represent $10 billion of the wealth management industry’s $4 trillion (less than 1% of all managed account assets), a Business Insider study estimates that this figure will rise to 10% by 2020. This equates to around $8 trillion AUM. 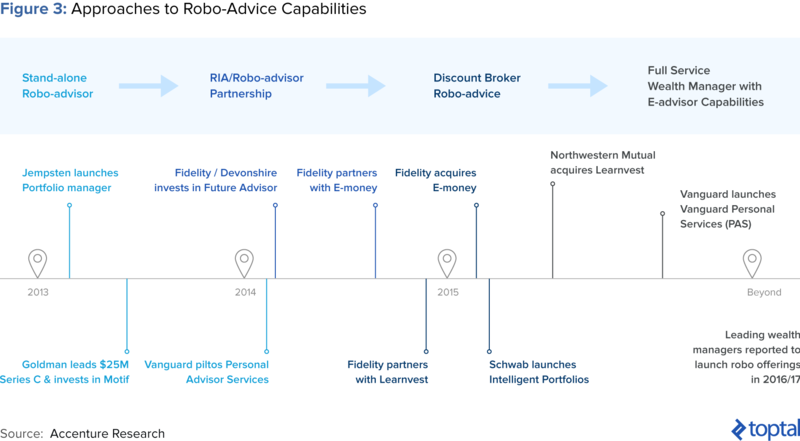 Industry players have adopted varied approaches to robo-advisory. Smaller wealth management firms are adding algorithmic components to automate their investment management, reduce costs/fees, and compete with robo-advisors. On the other hand, established investment firms are buying existing robo-advisors, such as Invesco’s acquisition of Jemstep or creating their own robo-advisor solutions, such as FidelityGo and Schwab’s Intelligent Advisory. Robo-Advisors vs. Financial Advisors: Will Humans Be Replaced? Insurance relies on the balance of risk amongst pools of people; insurers group similar people together, and some people will require payouts while others won’t. The industry is built around risk assessment; insurance companies are no strangers to data analysis. However, AI can expand the amount of data analyzed as well as the ways it can be utilized, resulting in more accurate pricing and other operational efficiencies. Startups are at the forefront of pushing the industry forward. According to Henrik Naujoks, a partner at Bain & Co, “The start-ups are showing what is possible and what can be done. A lot of incumbent executives are looking at it — they don’t really understand it but they want to get involved.” Investors have also caught onto this trend (see below). 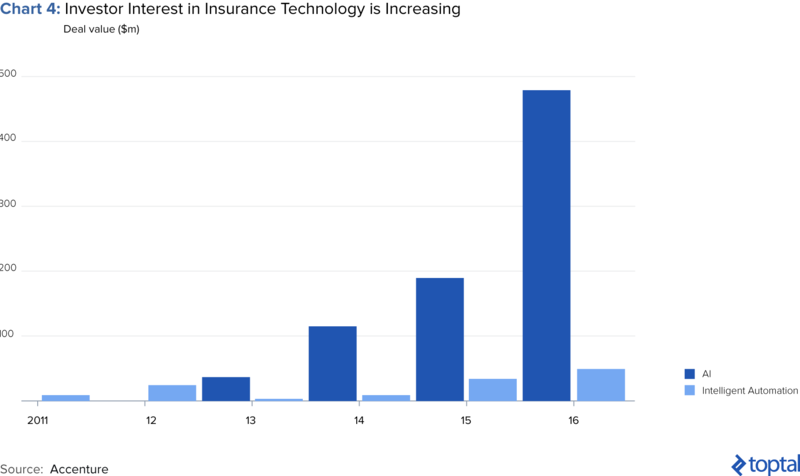 In 2016, AI was one of the most popular themes for insurance tech investment. A PWC report predicts that AI will automate a considerable amount of underwriting by 2020, especially in mature markets where data is available. Currently, an insurance underwriter, with the help of computer software and actuarial models, evaluates the risk and exposures of potential clients, how much coverage they should receive, and how much they should be charged for it. In the short term, AI can help automate large volumes of underwriting in auto, home, commercial, life and group insurance. In the future, AI will enhance modeling, highlighting key considerations for human decision-makers that may otherwise have gone unnoticed. It’s also predicted that advanced AI will enable personalized underwriting by company or individual, taking into account unique behaviors and circumstances. Enhanced underwriting may leverage not only machine learning for data mining, but also wearable technology and deep learning facial analyzers. For example, Lapetus, a startup, wants to utilize selfies to accurately predict life expectancy. In their proposed model, customers will email their self-portraits, which computers will then scan and analyze—analyzing thousands of regions of the face. The analysis would consider everything from basic demographics to how quickly the person will age, their body mass index, and whether they smoke. In addition, wearable technology could make the underwriting process more collaborative. Instead of relying on lengthy medical checks and complicated contract processes, wearables can provide real-time insights into policyholder health and behavior. Clearly, machine learning in finance is already evolving. These types of nuanced, real-time risk analyses will enable not only more accurate customer pricing, but also early detection of health risks and an opportunity for insurance companies to invest in prevention. Instead of eventually paying for costly treatments for the patient, insurance companies can proactively try to lower the probability of damages and associated costs. In a 2013 Oxford study analyzing over 700 professions to determine which were most susceptible to computerization, insurance underwriters were included in the top five most susceptible. Even where AI does not completely replace an underwriter, AI automation can alter an underwriter’s responsibilities. AI can free up an underwriter’s time for higher value-add, such as assessing and pricing risks in less data-rich emerging markets, providing more risk management and product development feedback. Improved customer data accuracy. The claims process is fairly manual: Human agents manually log customer information and incident details. According to an Experian report, data quality can suffer: incomplete data accounts for 55% of data errors, while typos comprise 32%. AI can improve accuracy by reducing manual input. In addition, claims processes often require insurance agents to match customer information with numerous databases. AI can be used to do this more efficiently. Faster payout recommendations. According to a J.D. Power & Associates property claims satisfaction study, slow claims cycle times are one of the largest contributors to customer dissatisfaction. AI can help to reduce turnaround times by first validating the policy, then making determinations on the claims and whether to automate payment. This is because AI has the ability to analyze not only structured data, but also unstructured data like handwritten forms and certificates. Banks are making big bets with their client-facing virtual assistants, known as chatbots. While the early versions of chatbots will only be able to answer basic questions about spending limits and recent transactions, future versions are slated to become full-service virtual assistants that can make payments and track budgets for consumers. Engaging with customers can translate into significant cost savings, but human interactions are also undoubtedly more complex than straightforward number crunching. Critics point to chatbots’ lacking of empathy and understanding, which humans might need when dealing with difficult financial decisions and situations. For this technology, AI technology of natural language processing will be essential for processing and responding to personalized customer concerns and wishes. 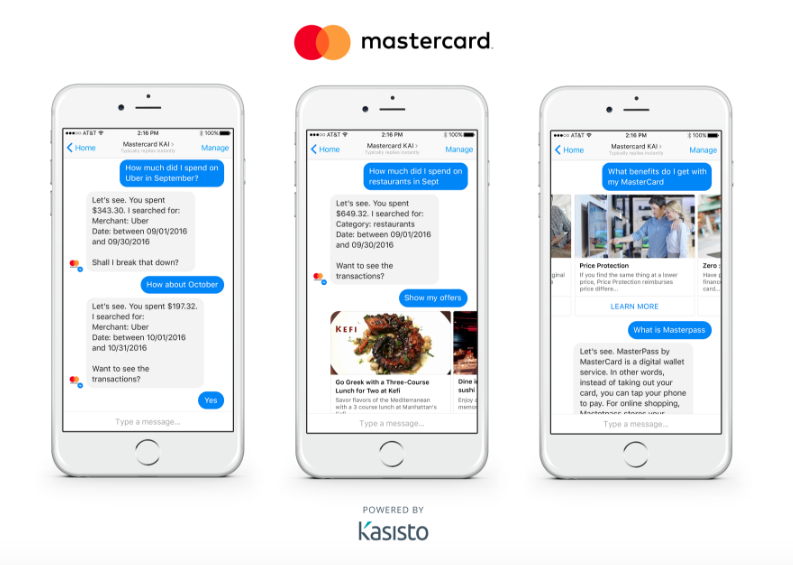 In October 2016, both Bank of America and MasterCard unveiled their chatbots, Erica and Kai, respectively. These will allow customers to ask questions about their accounts, initiate transactions and receive advice via Facebook Messenger of Amazon’s Echo tower. As AI continues to proliferate our personal and professional lives, many issues will continue to emerge. These include the potential for mistakes, a general sentiment of distrust towards machines, and concerns about job replacement. It would be a mistake to disregard these fears. Still, society is already on an accelerating path forwards towards an AI-driven world. In this new world, it could be most productive to focus on how machines and humans can best co-exist. It will be important for policymakers to remain cautious, allowing new technologies to develop while monitoring and minimizing their negative consequences. Developers and designers should also enhance the ability of humans to understand AI systems to build trust and increase satisfaction with AI applications. Everybody will have a role to play. Thanks for those insights Melissa!